Not undermining the recent crisis facing Etisalat , still they haven't relent is satisfying their customers with amazing offers , they are out with another one called Etisalat Super Bonus Offer (Revamp) just after their recent Welcome Back Offer . This Etisalat Super Bonus Offer is for both old and new customers , this offer gives you 10⨯ times the values of your first recharge daily. Which means you can enjoy as much as N10,000 on a daily basis for 30 days to call all network .This #SBORevamp is for both existing and new customers irrespective of your tariff . 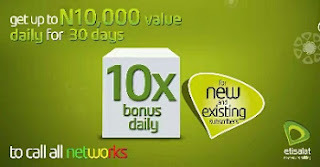 For New Customers : You will get 10⨯ the value of your recharge daily for voice calls and data for all networks in the first month. For Old Customers : You will get 7⨯ the value of your recharge daily for calls only to all networks for 30 days . Note that voice bonus is valid for 7 days while data bonus is valid for 1 day. New customers will also get 7⨯ bonus on their first recharge daily for calls only to all networks for the 2nd and 3rd months. Simply dial *819*1# to enjoy this amazing offer . its real,, I love this..
.wow.. thanks indeed great.. buh this people self wetin old customers do?